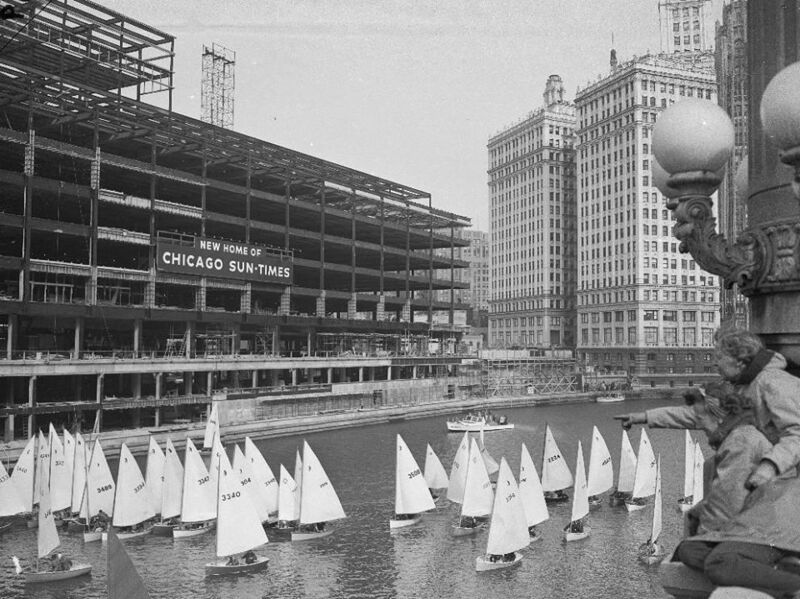 October 25, 1957 – The Chicago Sun-Times begins moving from 211 West Wacker Drive into its new headquarters building on the north branch of the Chicago River between Wabash Avenue and Rush Street. Completion of the move is expected by the end of November. As part of the groundbreaking ceremonies in November of 1955, 600 dignitaries, including Mayor Richard J. Daley, Governor William Stratton, and Senator Everett Dirksen, came together in the Palmer House to celebrate what was considered to be the keystone of the Fort Dearborn Project, a plan to redevelop the city north of the river and west of Michigan Avenue. The building was the first building in the city to use “curtain wall” technology, in which the building’s steel frame provides structural integrity, and the window glass and mullions act as a curtain covering that frame. 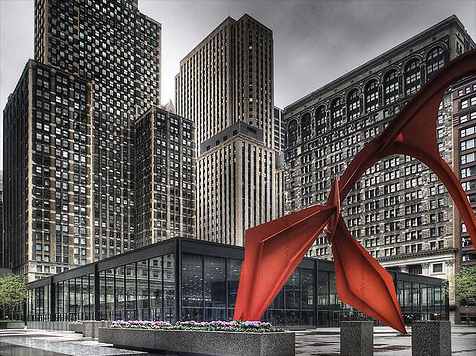 The structure was designed by the architectural firm of Naess and Murphy, the same firm that designed the Prudential building, finished two years before the Sun Times building opened. Critical opinions of the building differed. Said Professor Robert Bruegmann of the University of Illinois at Chicago, “If it got as far as 2007, there would be a very considerable interest in putting it on the National Register of Historic Places. A lot of these buildings are killed off at just the moment before they come back into their own.” [Chicago Magazine, January 5, 2004] The building was levelled to make way for Trump Tower which opened in 2008.